We can see the Pepper Pot from one of our attic windows. If I take a direct route and go on my own, I can walk there in about 15 minutes. Castlebarrow is a small even by the standard of the areas very modest hills. Never the less it commands a very extensive view, of Silverdale, of Warton Crag, of the Nuclear Power Station down the coast at Heysham, Lancaster and the Ashton Memorial, Clougha Pike and the Bowland Fells and if you stand in the right spot and the weather is clear of Ingleborough in the Yorkshire Dales. Sometimes you can see the Tower at Blackpool. On a couple of particularly clear evenings last September me and my dad could see the mountains of North Wales from here and watched as the lights came on along the Welsh coast. Is the Pepper Pot easy to find. I’m thinking of taking a group of kids there shortly and wanted them to find their own way. Unfortunately it’s not pin-pointed on the OS map. I think that Eaves Wood is generally a good safe place to take kids. However, navigation can be awkward. There are lots of paths most of which are not on the map. I know of people who have had a very pleasant couple of hours in the wood, but have never managed to find the Pepper Pot. There is a waymarked route from the car-park. There have been a couple of Orienteering events in the wood. The maps produced for those would be much more detailed. I don’t know who organised them, but i would guess that it was South Ribble Orienteering Club http://www.sroc.org/. Whether they could supply maps I don’t know. 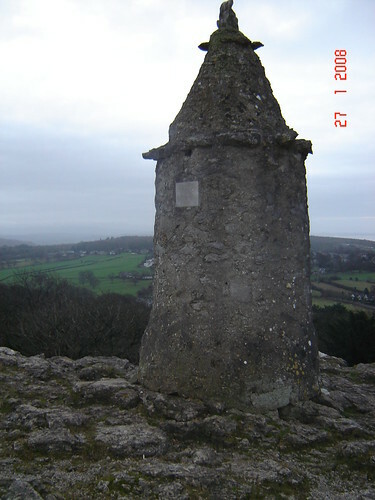 Does anyone know what the sculpture on the top of the Pepperpot is supposed to be. It is very weather worn at present? I’ve often wondered what it might represent, or whether it was intended to represent anything at all. Sorry not to be of more assistance. 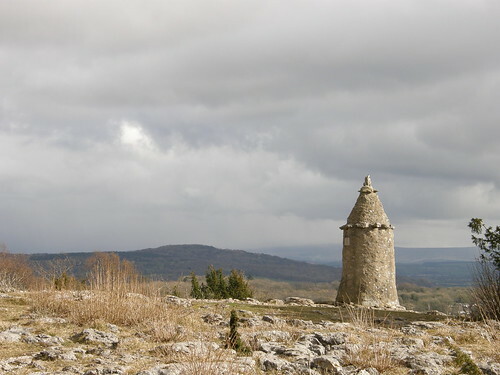 We’ve got a “Pepper Pot” on the moors not far from us too. Haven’t visited that one though, in fact, didn’t even know about it. I have to say I hate the fact that you can see Heysham Power Station from so many places in and near the Lakes but it’s certainly a landmark isn’t it? Sellafield never looks as bad somehow. Yes, it’s a lovely area. The walk from Farleton, through Beetham to Arnside YHA sounds absolutely great. I’m on the look out for ideas for walks like that, with accommodation at the end, to do with my own kids.